The perfect counterpart for the big and soulful gins we find on the market today. 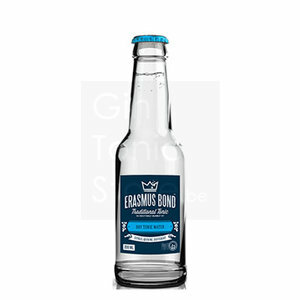 Erasmus Bond Dry Tonic was developed with a very specific function in mind, which is to be the perfect counterpart for the big and soulful gins we find on the market today. The nose starts off with a surprising blend of grapefruit, blood orange and bergamot and is a lot less “Dry” than one might expect. This is quickly forgotten though after the first sip which is neat and clean yet surprises the palate with a unique combination of grapefruit and gentian root. As it dies away the dryness becomes omni­present with quinine and bergamot taking the leading roles. Nose: Grapefruit, bergamot and sanguinello. Mouth: Neat and clean, with a velvet mouthfeel, gentian root and again a lot of ruby red grapefruits. Aftertaste: Long but very clean with loads of quinine and bergamot.